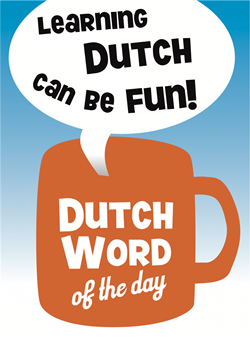 ‘Donder’ is the Dutch noun for ‘thunder’. It is often used as an expletive and today’s phrase is an example of that. It’s however a perfectly normal expression to use, although probably not in formal communication. You can use this expression when you are sure something will happen. Often it implies you are expecting it based on previous experience. You can also use the expression in the form: “Je kunt er donder op zeggen dat […]”, see the Examples below. – “Zeer zeker”: most certainly. – Donder: thunder [noun] [de donder, de donders]. – Donderdag: Thursday [noun] [de donderdag, de donderdagen]. Note that we speak of ‘Day of thunder’ as opposed to “Thor‘s Day”. – Zeker: certain, sure [adjective/adverb]. – Geheid: certain, sure [adjective/adverb]. This entry was posted in Dutch phrase of the week, DWOTD 1.0, Vocabulary Intermediate and tagged daar kun je donder op zeggen, donder, donderdag, geheid, verwacht, zeker by Sander. Bookmark the permalink. – You can bank on that. All three are recognizable but reasonably rare where I come from (Scotland). “You can count on that” is probably the most used variation. Those sayings will be recognized but considered old-fashioned in the Western-U.S. (that’s all I can speak for). Perhaps the last one (“You can bank on that”) is most used. Keep up the good work, I’m loving the insight!